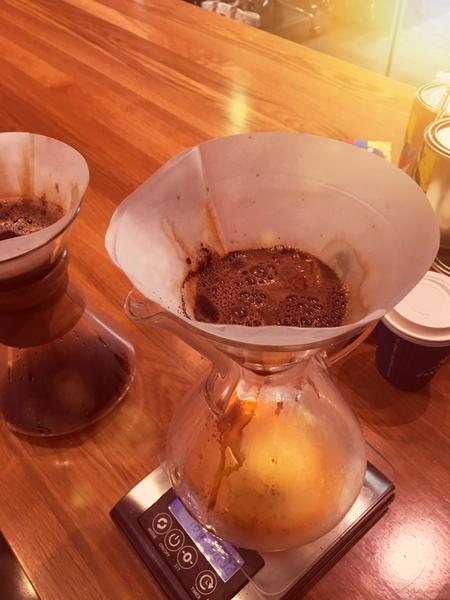 This is Merlo's exclusive "Cup of Excellence" award winning coffee being filtered through a Chemex - one of the best methods for tasting the complexities and subtleties of a bean - at today's coffee tasting, called a 'cupping'. Coffee expert David took us through the art of cupping and how the awards are stringently judged each year. The "Cup of Excellence" beans are the bean of the month for December and they expect the beans to sell out fast. We were lucky enough to taste the coffee on its own and with milk so we could ascertain the difference between the two. The "Cup of Excellence" beans have a round bodied flavour with notes of brown sugar, butterscotch, waffle and more.